Finishing high school is a huge step forward in your life. There's a lot of pressure to succeed, and it can sometimes lead to disappointment. However, it's important to remember that there are ways to improve your matric results, and it's not the end of the world. Those hoping for better marks have quite a few options - from remarks to rewrites. It might not be your first choice to go through writing an exam again, but if you do choose to go this route, rest assured there are some great tech tools that can help you. Finding past exam papers to practise on can be a struggle. That's why Don't Fail was created. The app gives you access to a wide database of SA exam papers in key subjects, right from your smartphone. You can organise your subjects for quick access on the app, mark exams as done when you've completed them, or save them for later access. Don't Fail is available for Android or iOS. Past Exam Papers is another app where you can find, well, past exam papers. There are over 2000 papers on the app, covering a wide range of subjects. There are some cool features, like being able to share papers via WhatsApp, save your papers, and more. 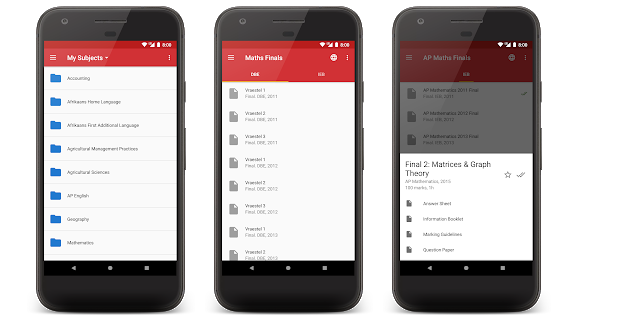 Past Exam Papers is available on Android. Prepare for a brighter future with Vodacom e-school. This platform helps you learn anywhere - on your smartphone, tablet or desktop computer. Vodacom e-school provides easy-to-follow video lessons and other resources for grades R-12. There are loads of useful features, including quiz questions and evaluations. The best part is that Vodacom customers won't pay for data while using Vodacom e-school, as the site is zero-rated. Stay up to date with tech when you upgrade on Vodacom Online. You'll get free delivery, free connection and free SIM. Now that's smart!